Free Shipping Included! 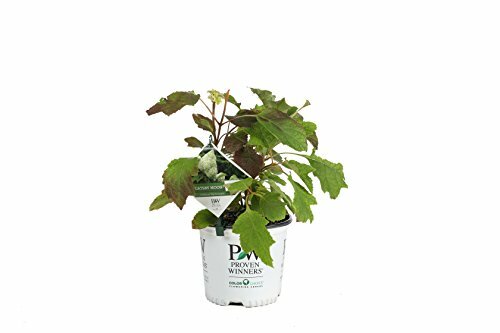 Gatsby Moon Oakleaf Hydrangea (Quercifolia) Live Shrub, White to Green Flowers, 1 Gallon by Proven Winners at The Net Stores Network. MPN: HYDPRC3606101. Hurry! Limited time offer. Offer valid only while supplies last. Gatsby Moon’s doubled florets are weather-resistant, tightly packed, pure white, and create full, conical panicles with a unique ''quilted'' effect. Gatsby Moon’s doubled florets are weather-resistant, tightly packed, pure white, and create full, conical panicles with a unique "quilted" effect. Blooms turn a nice shade of green that lasts most of the summer, then turn a wonderful wine-red in the fall. Native to North America, the Gatsby Moon Oakleaf Hydrangea from Proven Winners produces white flowers that change to green as they age. This shrub also provides excellent wine-red foliage in fall. Prefers partial to full sun (4+ hours) and moist, well-drained soils. Grows to be 6-8 feet tall and wide. At time of shipment, this plant will be about 1 year old. Blooms from early to late summer. May need winter protection in the north. One gallon shrubs are 6-18 inches tall when they are shipped, depending on the season. This hydrangea is perfect for landscapes.